2. Create moist conditions to facilitate speedy restoration of the wounded area using various, recently-developed dressing materials such as hydrophilic polyurethane that is air-permeable but inhibits passage of water. 3. Help sustain physical functions. 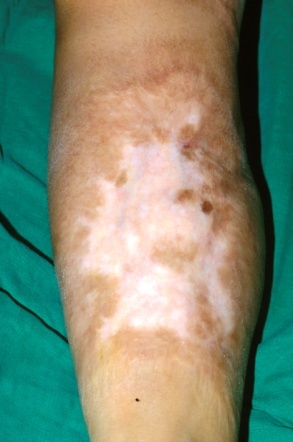 4.Minimize hyper- or hypo-pigmentation and burn scar formation (Figure 1). Figure 1. As burns may cause hyperpigmentation, hypopigmentation and irregular, shiny scars, it is important to shorten the treatment period to the early stages of a burn as much as possible to minimize such scarring. Firstly, the source of heat should be separated or eliminated from the patient. Cool down the burn immediately by holding it under running water for about 15-20 minutes, at 8℃. For children, extended exposure to cold water should particularly be avoided to prevent the risk of hypothermia. - The wound should be covered with sterilized, clean gauze or dressing to prevent the burn from deepening. Referral to a specialized burn center is recommended. 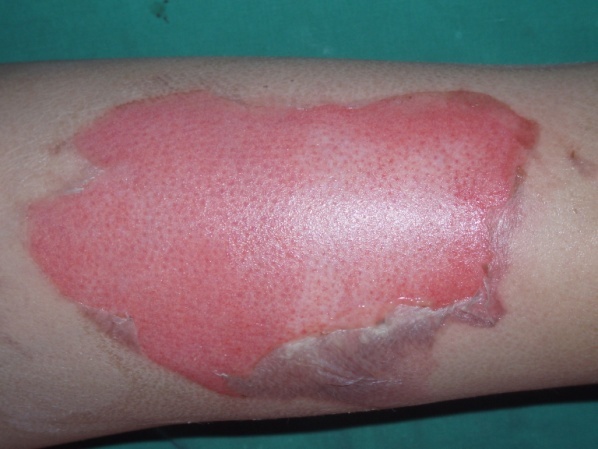 - Efforts should be made to prevent continuous edema of a burned area as it may increase the chances of infection. - In order to reduce edema, have the patient practice regular exercise and elevate the burned area to a level slightly above that of the heart. The upper limbs may be elevated appropriately using a sling. - Such precautions can help to prevent burn-induced edema from lasting longer than 3 days. - As lower limb burns cause more severe edema and pain due to walking, elastic bandages such as Ace bandages may be used to reduce the edema and pain. There is controversy over whether to eliminate blisters immediately to prevent infection in the early stage of a burn or to drain the blisters while leaving the separated epidermis in place to protect the wound and stimulate the healing process. According to my clinical experience, preserving the separated epidermis of blisters is very helpful for maintaining moist condition, preventing drying out of the wound, protecting the wound, and relieving pain. Therefore, good therapeutic effects may be obtained by drainage and preserving the blistered epidermis in place, if possible (Figure 2). Figure 2. 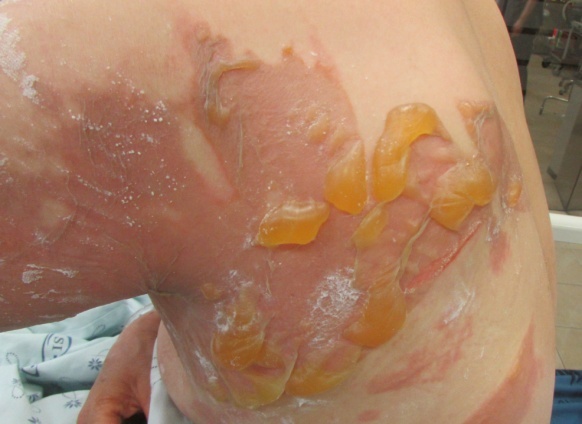 2nd degree burn caused by hot water, forming large blisters the next day. I broke the blisters and preserved the epidermis in an effort to protect the wound and to take advantage of biological dressings. Just applying a topical agent on the blisters is not helpful for treatment. According to the results of analyzing exudate from inside blisters, immunosuppression due to impaired polymorphonuclear cells (PMNs) and lymphocytes, interference with neutrophil chemotaxis, opsonization due to arachidonic acid in the blister fluids, and detrimental factors causing inflammation were present, indicating the benefit of removing the exudate (Figure 3). Figure 3. Removing blisters completely from 2nd degree burns causes the wound to dry and partially deepen. Often the patient complains of pain, thus complete removal is not helpful for treatment. Recently, cultured epithelial cell has been proven useful for burn wound care. However the high price of the material and the resultant financial burden comes as a drawback to the usage of cultured epithelial cells. Blisters occur at the level of the stratum spinosum and, if preserved well, most mid-2nd degree burns may recover within two to three weeks. If blisters are completely removed, most wounds dry up, causing pain (as the zone of stasis transitions to the zone of necrosis, possibly deepening the burn). Thus exudate should first be removed while keeping the epidermal flap, and the wound should be dressed with dry gauze or an absorptive sponge-type dressing to absorb additional exudate until the epidermal flap adheres and dries completely for recovery (Figure 4). If a deep burn oozes fluid continuously for more than one week or the fluid becomes murky and smelly, this is an indication that the epidermis has lost the natural capability of serving as biological dressing. 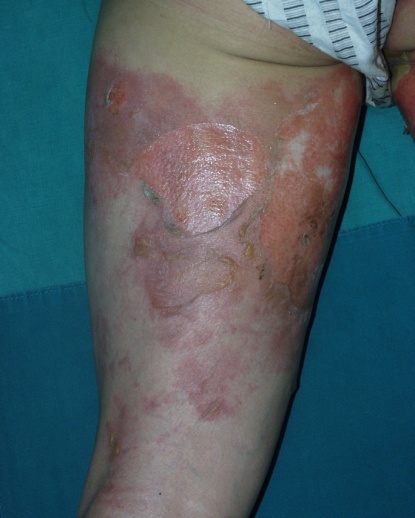 In this case, it should be removed immediately and replaced by a cultured epithelial homograft or synthetic biological dressing according to the latest views on burn management. Figure 4a. Day 1 of sustaining a scalding burn on the right thigh. Figure 4b, 4c. On Day 3, the blisters were preserved as far as possible and cultured epithelial homograft was performed on the exposed areas. Figure 4d. On Day 6, the wound was already epithelized on the area where blisters were preserved, while epithelialization was still in progress on the areas where cultured epithelial homograft was performed. Figure 4e. On Day 7, epithelialization was still in progress in parts of the areas where cultured epithelial homograft was performed. Figure 4f. On Day 12, after complete recovery on Day 8, the wounds appear less severe on the areas where the blisters were preserved. - Pollutants remaining on a burned area should be removed. 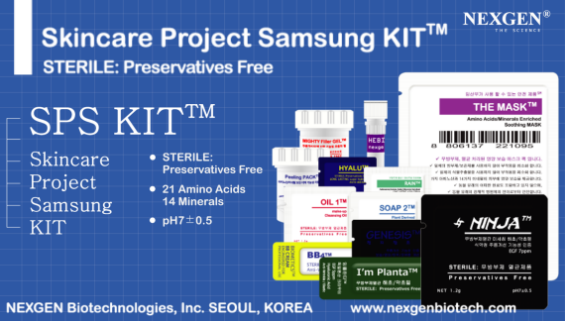 - Tepid or room temperature normal saline, chlorhexidine gluconate soap, or non-irritating soap may be used for gentle cleansing. - When removing materials such as tar or asphalt, which will not come off easily, the burn should be first cooled with cold water. The materials can then be removed by dissolving them with mineral oil, sunflower seed oil or solvent (Figure 5). Figure 5. 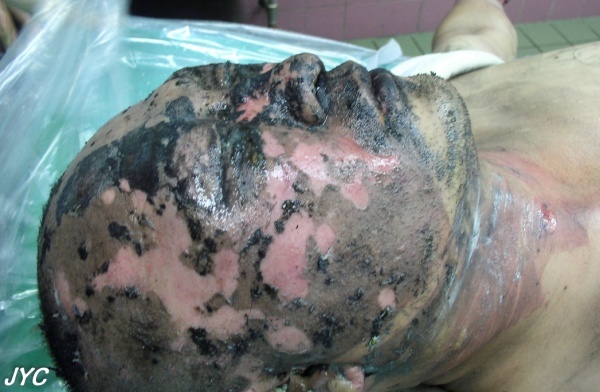 A facial burn by tar was cooled with cold water and then mineral oil was applied to cleanly remove the tar without inflicting additional wounds. Recently the use of topical agents has decreased, with the exception of special cases such as with severe burn patients, as most agents may cause unwanted local or systemic side effects or delay the process of wound healing. If a topical agent must be utilized, sulfadiazine ointment is often a reliable option, with the fewest side effects and reduced pain. However, because silver sulfadiazine cream interferes with the process of epithelialization, it is not recommended for use once reepithelialization starts after necrotic tissue or eschar has been eliminated. Sulfamylon (mafenamic acid) may be used for ear burns which can pass through thick eschar and often cause chondritis. Additionally sulfamylon may be used to treat pseoudomonas infections or for the prevention of wound sepsis caused by deep tissue necrosis and accompanying infections. However, one should take into account that sulfamylon also causes severe pain in the burn victim. It is not advisable to apply topical agents unconditionally to every burn as topical agents thickly applied to 2nd degree burns with large blisters may penetrate the blisters, leaving no choice but to remove the epidermis, which plays an important role in protecting the wound. Applying topical agents to the facial area should also be avoided as it may irritate the eyes (Figure 6). Figure 6. Sulfadiazine ointment should be avoided for facial burns since it may irritate the eyes and interfere with the protective action of blisters, hindering the progress of treatment. - Do not expose wounds to air for a long time until they are well dried (Figure 7). - Use hydrogel-type dressing materials for the first one or two days to cool down the wound and relieve pain. - When it is difficult to maintain dressing properly, such as on areas like the face, apply a non-irritating ointment continuously as required, to prevent wound drying. - Blister exudate may be absorbed by using normal, saline-soaked mesh gauze, changed twice a day, for two to three days; this method also reduces inflammation and edema. - For dressing, apply an elastic bandage with appropriate tightness that does not interfere with the blood circulation (soft splints). Figure 7. The above wound has been exposed in the air for a long time, partially deepening the burn on the inner thigh. The epidermis plays an important role as a physical barrier against microorganisms and, because it is composed of lipid components, it is also important for inhibiting moisture evaporation. When treating partial thickness burns, the focus is to induce reepithelialization as soon as possible from dermal appendages mostly distributed in the reticular dermis. This allows minimization of the hypertrophic scar or dyspigmentation within 3 weeks for better functional and aesthetic results (Figure 8). 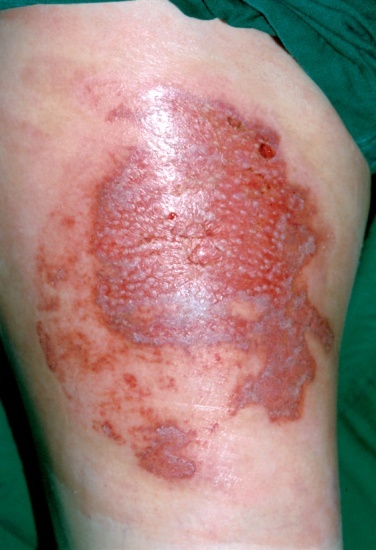 For the treatment of such burns, therefore, it is important to induce epithelialization by using an appropriate dressing material for maintaining moist conditions. There are also many studies investigating materials that promote epithelial cell regeneration, such as various cytokines, peptide growth factor (of which recombinant FGF is currently available), protease and growth hormone, based on genetic engineering. 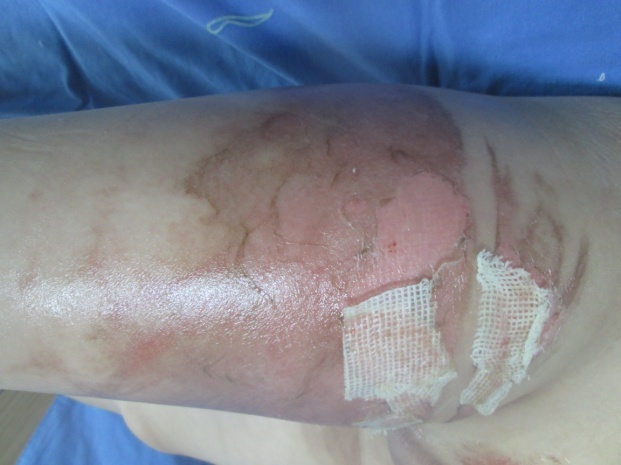 Generally, the mechanisms of wound healing in 3rd degree burns involve mostly wound contracture and epithelialization of the surrounding tissues, although the effect of epithelialization is weak because most of the dermal appendages, which are the main sources of epithelialization, are lost. Eschars made of necrotic tissues prevent wound healing and are generally separated by microorganisms present in the skin or are spontaneously separated by epithelialization from the dermal appendages under the eschars. Since eschars prevent wound healing, they should be surgically removed as soon as possible to induce wound healing before conducting wound closure. Since the depth of a burn changes much within the first week of sustaining the burn, it is very difficult to predict the general depth during the early phase of the burn. However, blood vessels around the wound may be injured and edema caused by burn or fluid resuscitation may compress dermal vessels, impairing the blood circulation and thereby causing the zone of stasis to convert to the zone of necrosis, deepenuing the burn. These variables contribute to the over 30% error rate of predicting the burn depth in the early phase. It is important, therefore, to accumulate enough personal experience to establish a proper management plan within 1 day of the burn’s occurrence. For example, in the case of hand burns, erroneous measurement of burn depth often leads to unnecessary surgery or omission of a surgery necessary for functional improvement. If a patient requires surgery, systematic planning, such as selection of the graft type and donor site, should be established and wound closure via a one-step procedure should be also considered, as it is beneficial for a good postoperative outcome. The burn care team should try to deliver coordinated and reliable treatments for the patient’s mental stability. Protection: A bandage is a protective barrier for the injured skin against microorganisms. Metabolism: Bandages reduce evaporative heat loss and minimize cold stress and shivering. Burn patients have an evaporation rate several times greater than that of the normal people (150ml/24 hours), causing a 10 times greater caloric demand and need for fluid replacement. Comfort: 2nd degree burn wounds are very sensitive to exposure to the air and deep thermal burns cause severe pain due to reeinnervation with time, which is why occlusive dressing should be utilized. Most burn patients complain of pruritus, which occurs more often in children and on the legs than the arms. The etiology is still unknown, although it is suspected that increased bradykinin and endopeptide due to burn inflammation might be the cause. For management of pruritus, antihistamine administration, cool compression, application of aloe or alcohol-free lotion with an astringent effect as well as oily lotion may be used. Step 4: Hydroxyzine 0.5mg/kg/PO q 6h, Cyproheptadine 0.1mg/kg/dose PO6h, and Diphenhydramine 1.25 mg/kg/PO q 6h should be administered alternatively every 2 hours while the patient is awake.